The play starts with the Bhulakshmi Devi, the child less queen of the king Nava Bhoja Raja praying sage Jatanga for children. The sage tells her to take just seven fruits from a mango tree in the garden and eat, and by doing this she will be blessed with seven children. The queen, out of the desire to have more children, plucks the eighth fruit from the tree. The eighth fruit was reserved to the snake king Nagendra. The snake king Nagendra, who guards the tree gets angry and wants to punish the queen by killing her. The queen begs Nagendra for life so that she can have seven children and then give away her life to him as repentance. Nagendra agrees to the queen’s plea. The queen gives birth to seven babies. The 7th child is Balanagamma who is very beautiful. Then, asks her husband to give permission to fulfill the repentance. But her husband refuses and abuses Nagendra. The enraged Nagendra enters the royal palace and kills the queen, for every person has to undergo the effect of the deeds. After Bhulakshmi’s death, the king marries Mandula Manikyamba Devi. The new queen tries to kill Bhulakshmi’s children out of jealousy but the mother’s soul protects and nurtures them. The seven maternal uncles of the Panuganti family marry the seven girls respectively. The youngest one, Karyavardhi, marries the youngest Balnagamma who later gives birth to a son ‘Balavardhi’. The evil magician Mayala Marati in his ‘ghosts den’ has lost passion for his fiancé Sangu. Now he wishes to go for the world’s most beautiful woman. He comes to know that Balanagamma is the most beautiful woman, and with his magical powers, transforms her into a dog, and brings her to his den to get married with her. Balanagamma’s husband Karyavardhi with his brothers comes in search of his wife. Marati turns them into statues. After nine years, the grown up Balavardhi, son of Balanagamma comes to know about the abduction of his mother and that his father went missing while searching for his mother Balanagamma. Balavardhi decides to find his parents. During his search, he kills a tiger, marries the daughter of the king of that country. On the direction of Nagendra (The snake God), he goes to Marati’s place. Here, with the help of an old lady Tamballa Pieddi, he enters Marati’s den. Keeping Marati under intoxication of liquor, Balavardhi meets his mother Balanagamma in the jail. With her help, he extracts the secret of Marati’s life. Balavardhi crosses seven seas and brings the parrot in which Marati’s life reserved and kills him. 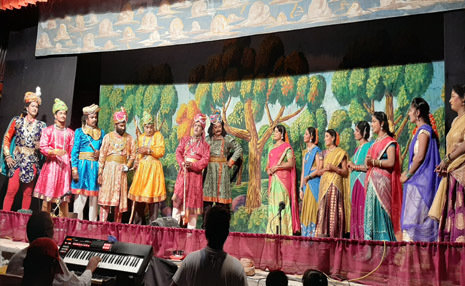 The play ends with Balavardhi’s union with his parents, Balanagamma and Karyavardhi.